French winger Georges-Kevin Nkoudou couldn’t wipe the smile off his face after making his first ever start in the Premier League. The 23-year-old, who made the move to England in August 2016, having represented Nantes and Marseille in Ligue 1, made nine appearances from the bench for Spurs following his £11m transfer but struggled to break in to the starting XI. Nkoudou, who has played five times for Mauricio Pochettino’s men in the Champions League, had featured as a substitute for Burnley in games against Crystal Palace, Manchester United, Newcastle United and Swansea City but was given the nod for the trip to the Hawthorns. 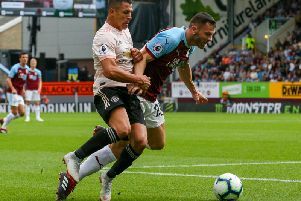 The winger, who deputised for the injured Johann Berg Gudmundsson, played 69 minutes in the Midlands as strike duo Ashley Barnes and Chris Wood netted in a 2-1 win over West Bromwich Albion. “I’m very happy because it’s my first start in the Premier League,” he said. “Even at Tottenham I never started so I’m very happy today. I want to carry on like this. “It’s been long but I never gave up. In training I’ve worked hard to get my first start in the Premier League so I’m very happy. “As a football player you wait for this moment. It’s a big moment. It’s an achievement to get that start and that position on the pitch. It’s a good moment to start in the Premier League, in any league. Nkoudou was impressed with the display at the weekend as the Clarets registered their 24th point on the road this term - more than three times the amount accrued last season. “We’ve worked well in training towards this game,” he said. “We spoke before the game and we came here to play well and return home with the three points.